When: July, 10 2015 10.30 a.m. – 12.45 a.m.
High expectations on the development of social enterprises are focused on the new “social finance”. And there is much thinking about it – even in the SEWF, Social Enterprise World Forum in Milan – particularly from the great financiers and policy makers point of view. The perspective of the territories is less present in the analysis, where the intervention must establish and effectively operate. 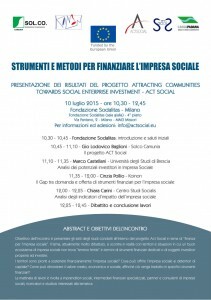 Act Social research project, conducted in Valle Camonica and based on funds coming from the European Union e with the University of Brescia support, has gone to verify in situ and in a very well defined area – Valle Camonica, rich of social cooperation experiences – in which terms, where and under which conditions the social finance can be defined as a promising tool for the social enterprise. Are territories and situations where there is the existence of a good social enterprise economist a “breeding groung” of rooting? Are there dedicated financial instruments and subjects who want to invest? Are territories ready to financially support the social enterprise? What can the social enterprise offer to the holders of capital? How can the social enterprise demonstrate the value created, wheter economic or social, in order to translate it into specific financial instruments? During the meeting you will have the opportunity to listen and discuss with the players the conclusions and possible extension of this important research and intervention job. Chiara Carini from Centro Studi Socialis. The event was developed by the network FATTI & EFFETTI, promoted by Fondazione Sodalitas to spread the culture and the practice of measuring the social impact in Italy. The morning works are directed to social entrepreneurs, specialized financial intermediaries, advisors and partners of social enterprises, researchers and scholars interested in the subject.